5.0 out of 5 starsInteresting Look At A Controversial Mr. Olympia! Interesting look at perhaps the most controversial Mr. Olympia ever! Personally I was mostly interested in seeing the footage of Frank Zane in this documentary since he is my favorite bodybuilder of all time. Frank had suffered an almost fatal injury (severing his urethra after falling into his pool when his chair slide into it) and was barely able to make this show. In retrospect he feels he would have been better served competing the following year. Anyway, if you are a fan of Bodybuilding you'll probably enjoy this as a slice of time captured of a past era! This short DVD is a good look at Arnold and some of the other prominent bodybuilders from 1980. You get to see training, interviews, and a lot of posing during the competition. I personally feel Arnold won due to his popularity and was definitely not the best competitor in the field. But this is a great DVD for any bodybuilding or Arnold Schwarzenegger fan. 5.0 out of 5 starsA must have for the golden era fans, although this a little past that era, but Arnold isnt. 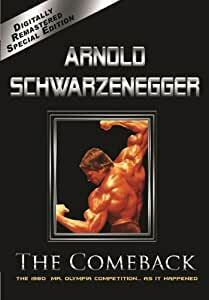 If you're a fan of the golden age of bodybuilding and Arnold, you need this in your collection. It was short but it was a "last look" or grand finale of that 70's bodybuilding era that I LOVED! I watched it 3 times in a row when I got. I seem the yearn for this time period. I think its just me getting old and not wanting things to change though. Be forewarned though, the soundtrack will make you stark raving mad. Not what I was expecting. Very short film and not nearly produced as well as Pumping Iron. Save the money. Awesome movie if you love bodybuilding. It was more then good enough well worth watching, about 6 times so far. Great product and fun to walk down memory lane with Arnold. He has provided great entertainment over the years and it was nice to get a look at the genesis of his public career. The video was shipped in a timely manner and arrived in excellent shape. This was a really cool movie to watch if you are interested in the Schwarzenegger at all! It opens your eyes to the world of bodybuilding as it was and just shows you how much showmanship Arnold really brings to the table. The guy knew what he wanted to do and did it...some of us could be so lucky.